My ambition is to write songs, to move hearts and to connect with YOU through the magic that is music and performing. The song I wrote below is about ambition. About keeping your eye on the end game. Whatever that may be, I hope this song will help inspire you to keep at it! No matter what comes your way. ''It' s always a great pleasure having Sarah performing her unbelievable and outstanding music at George. Her personality, her voice, her genuine and natural talent are simply making the difference. Her style and her music are beyond anyone else." "Tramp is very proud of you and all you are achieving. I have always said you are a very talented lady." Sarah showcases her talent in this medley of eight songs of very varied genres from modern hits, jazz standards, film music to 60's favourites and classical music. Listen to the interview on one of my songs 'Red Riding Hood' here. It was recorded live from Miami online radio show 'Ava Live Radio'. 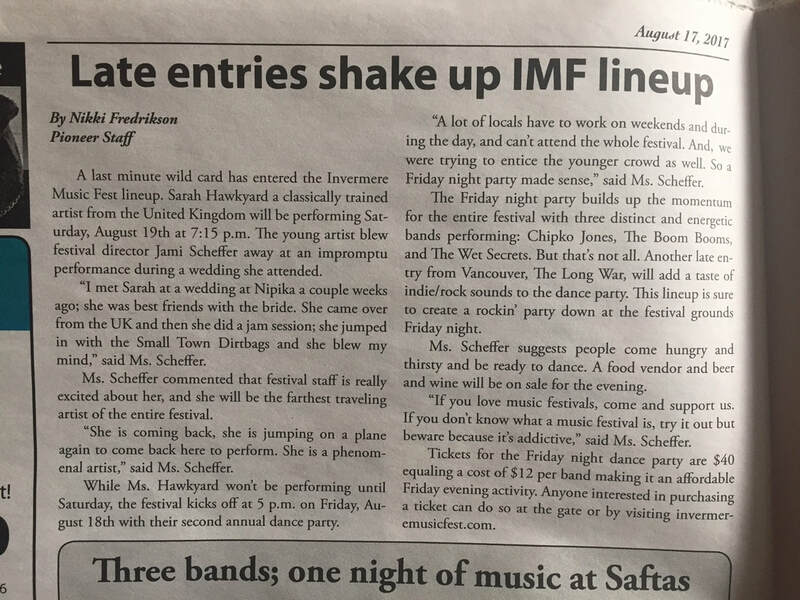 Article from a local newspaper in British Columbia, Canada prior to the Invermere Music Festival in August 2017.